Step 1 Chop ¼ cup each of tomatoes, cucumber and bell pepper from the larger pieces. Place in a small bowl; cover and set aside in the refrigerator. Step 2 Working in two batches, puree the remaining tomatoes, cucumber and bell pepper with garlic, 3 tablespoons oil, 2 tablespoons vinegar, 1 teaspoon salt and ½ teaspoon pepper in a blender until smooth. Transfer to a large bowl, cover and refrigerate until chilled, at least 2 hours or up to 2 days. Step 3 Just before serving, chop avocado and add it to the reserved chopped vegetables. Stir in basil and the remaining 2 teaspoons oil, 1 teaspoon vinegar and pinch each of salt and pepper. 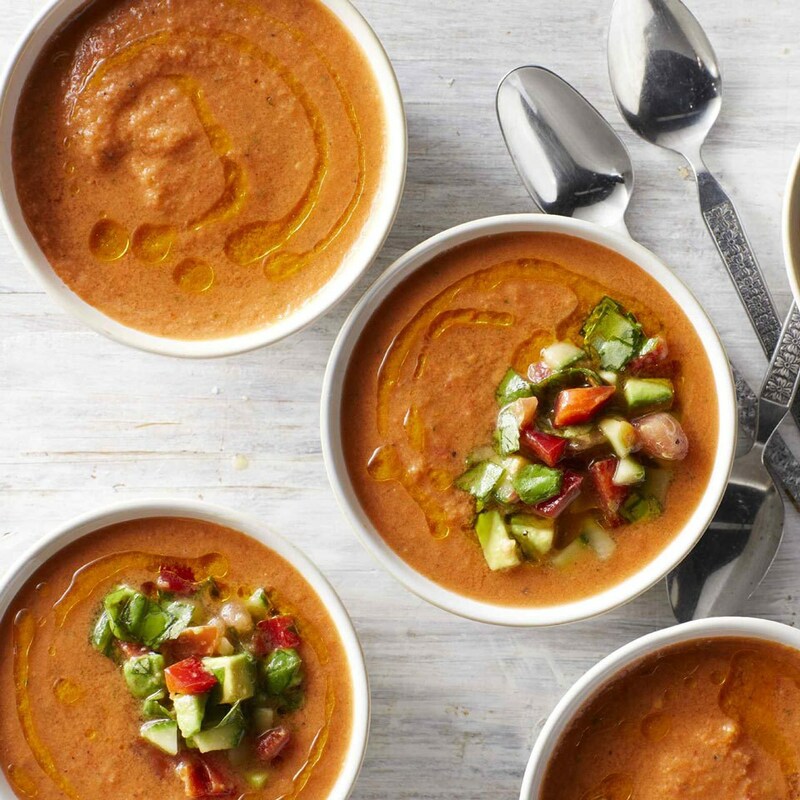 Ladle the gazpacho into bowls and top with the chopped vegetable salad. Many gazpacho recipes are thickened with bread, but this one uses just vegetables, making it a gluten-free refresher for a hot summer day. The key to any flavorful gazpacho is giving it time to rest. The flavors meld and become cohesive when the soup is allowed to sit a bit before serving.